Brian Vanden Brink is often chosen as architectural photographer by those in the design world. He has been photographing award-winning architecture for three decades. Brian�s name is synonymous with a respect for design and a passion for light. His work has been featured widely in a variety of design and consumer publications such as Architectural Digest, Architectural Record, Boston Globe Magazine, Coastal Living, Design New England, Down East, La Vie Claire, Maine Home & Design, Metropolitan Home, New England Home, New York Times Magazine, Photo District News, Residential Architect, and View Camera Magazine. His photographs grace many books including his own At Home by the Sea: Houses Designed for Living at the Water�s edge and At Home In Maine: Houses Designed to Fit the Land. Brian�s new book RUIN: Photographs of a Vanishing America is scheduled for release in the spring of 2009. RUIN is a photographic study of abandoned architecture throughout the United States. 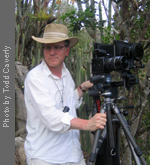 Vanden Brink was born in Omaha, Nebraska in 1951 and began his career in photography there more than thirty years ago. Upon moving to Maine in 1978, he began to specialize in architectural photography. Using a large format view camera, and working extensively with natural light, he has photographed dozens of award-winning projects nationwide. He occasionally lectures and holds workshops on architectural photography. Brian is passionate about photographing architecture. His primary focus is residential work but his archives include buildings of all types; from research and institutional buildings to schools, vernacular architecture and even abandoned buildings. When not photographing, he can often been seen motoring in his 1947 Willys Jeep in Camden, Maine where he lives with his wife Kathleen, to whom he has been married since 1975. Vanden Brink is very involved with his local church and also volunteers with the Yokefellows Prison Ministry at the Maine State Prison.